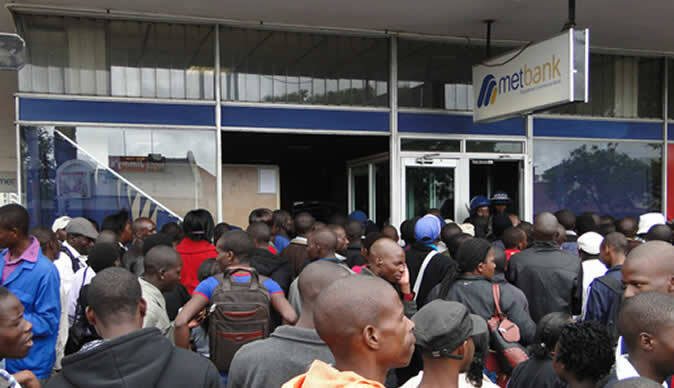 POLICE officers have broken a glass door at Bulawayo's Metbank in protest after failing to access their salaries. The anti-riot police officers have been called to maintain order. Some of the impatient officers said they had been queuing at thebank from as early as 5 am, but no one has been able to access cash. When an official from the bank tried to address the officers a few minutes ago, he was pelted with pieces of paper and small pebbles, forcing him to retreat hastily into the bank. So far no one has attempted to go into the bank through the broken glass door. This incident comes a few days after angry depositors ran amok at abank in central Harare on Monday, breaking down a door and smashing windows after money ran out to pay withdrawals as cash shortages worsen. Witnesses said Monday scores of depositors turned violent after officials at Allied Bank, owned by former mines minister Obert Mpofu, failed to explain why the bank faced cash shortages. They said riot police fired teargas to disperse the crowd demanding their money. In the first similar incident this month, a bank manager in the eastern city of Mutare had to take refuge at the local police station.